In the grand tradition of replacing components of Jurassic Park, YouTube user Michael T. Mann has drained all of the groundbreaking CGI effects from a few key scenes of the film. 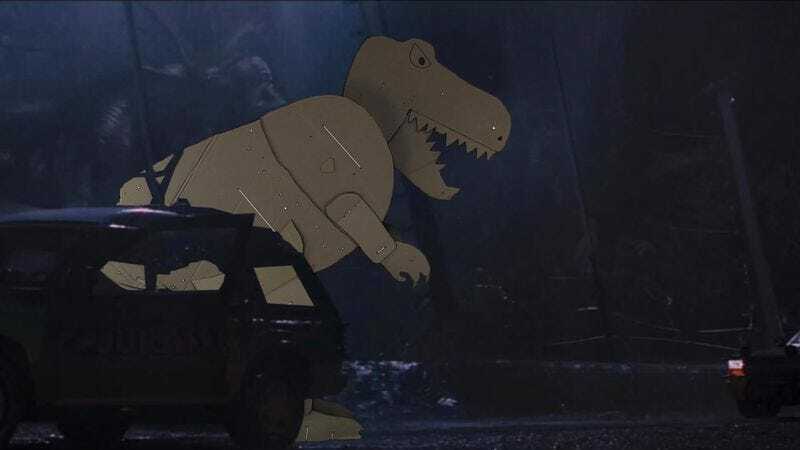 In their stead, Mann has injected groundbreaking cardboard puppets and inflatable raptors, which, along with the modified sound design, give the film a drastically different tone. Also, Arnold Schwarzenegger makes an appearance as a rogue helicopter technician with a machine gun and a T-Rex has a dance party with a robot, because, hey, why not?